In youth ministry we often use the phrase “that” kid, to describe the one that frustrates us the most, or completely exasperates us. Sometimes its the child on the spectrum, or the one who can’t sit still and just listen for 5 minutes. Or its the sullen too-cool-for-school kid that sets the tone for the rest of the group, or the know-it-all who has an answer for e-v-e-r-y-t-h-i-n-g. Often its the one who just doesn’t fit the mold of what we’ve decided kids should be like, and so they become “that” kid in our minds. Well, I have that kid. He’s highly intelligent, speaks sarcasm like its his second language (can’t imagine who he got that from), and is a total nerd. To quote him, he is “so far past nerd”. I asked him what is so far past nerd and he said, without missing a beat, “2,000 lightyears past nerd” and promptly stuck his earbuds back in to finish his Dr Who episode. AJ is 11, and in the 5th grade. He loves computers, Minecraft, and Nerf Guns (see Why Weeds and Nerf Darts). He could follow the lego building instructions around the age of 5, currently reads at about a high school level, and is rapidly working his way through his birthday “read” present (see Gift Giving) The Maze Runner because he knows he won’t be allowed to see the movie until he’s read the book. AJ on School Picture Day, channeling his inner Dr. Who. He also owns Rebelle crossbows, because they are cooler than regular Nerf crossbows marketed for boys. He ordered orange and yellow Chaco sandals because they were the ones he liked the best, and just stared at the salesman when he told AJ they were for girls (another post for another day…). To be fair AJ has pretty liberal parents in a pretty conservative area, so he may always be “that” kid. The different one, the one who doesn’t always act the way a boy “should” act. But I’ve come to understand some pretty awesome things about “that” kid, and all of “those” kids that we have in our lives. He didn’t suddenly become who he is: We are products of our environment. My parents took school seriously, so I had high standards. I value language and vocabulary, so AJ could use the word attribute in a sentence properly by age 4. His father encouraged his love of technology by letting him take things apart and try to put them back together, and by taking him to HAM Radio events, and Near Space Balloon chases. He wears Chacos because my husband and I wear Chacos. We don’t limit the computer as much as some might say we should, and as a result he’s learning basic programming, how to dance better in his dance class at school, and so much technical jargon about Minecraft that I can’t keep up. We are a mildly incredibly sarcastic family, so we have to keep our anger in check when we hear our own phrases being thrown back at us (don’t they just always sound so much snarkier coming from a little person? When I say it I’m sure I sound like a complete angel). Sometimes I think we need to remember that whoever your “that” kid is, there are a million external and internal forces that got him to this point. Embrace his personality fully: Sometimes its hard for me to understand why he would want to sit in front of the computer for hours watching you tube gaming tutorials, but he does. That same thirst for knowledge drives him to learn about aerospace, arguing with his “Pop-pop” about how we should go straight for a colony on Mars and skip the moon, and causing Pop-Pop to give up because he couldn’t out-argue him. I can’t make him into a different kid, nor should I try. His personality doesn’t hurt anyone, even if his countercultural tendencies set him up for being the target of teasing. In fact, God gave him awesome gifts that deserve to be embraced, like that of connecting with other people. AJ loves deeply, he doesn’t always show it well, but he has had the gift of connecting with kids with special needs since he was small. He goes to children’s church even thought he’s too old so he can help the 3 year old with his cut and paste work. He is a normal big brother who wishes we would sell his little bro to passing bedouins but then buys him a Minecraft lego set with his own money because he doesn’t want him to feel left out of AJ’s birthday celebrations. I wouldn’t trade the quirks that make him different because they are the same gifts that make him awesome. Don’t try to change him: I used to try to get AJ to like sports. I really like baseball, and so does my husband, and for about 3 years I tried to get AJ to like baseball. He will tell you now that he only goes to baseball games for the food. He has little interest in sports, and where we live currently sports are huge. It feels like everyone plays sports, especially boys. So I tried to get him to play on a team, and he resisted. He decided he was not into sports and probably wasn’t ever going to be. This doesn’t mean he is un-athletic, he can swim like a fish, and has a yellow senior belt in Tae-Kwon-Do. He is becoming proficient with a basketball because his step-dad likes to play (yet again external forces) but has no desire to play on a team, and that’s ok. I wrote an article for a class once about Multiple Intelligences and AJ falls into the category of Intrapersonal Intelligence (works best alone), and Logical-Mathematical. He is never going to be the interpersonal, bodily kinesthetic kid who likes team sports, that’s not the kid he was created to be. I have no business changing that. 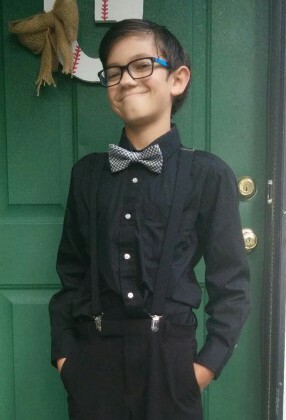 I have the really cool responsibility of nurturing his gifts and helping him become who he was created to be, even if that is the benevolent King of the Nerds. We as youth ministers get to do the same thing. We get to walk alongside all of our kids as they become “that” kid that God created them to be. Whole creatures desperately in need of God’s love, and ours as well. So look for all of those beautiful qualities in your very own “that” kid. I’ll bet you’ll find that the things that exasperate you, are the very same things that, seen through the lens of a loving parent (hmmmm God?) make them amazing. P.S. I had AJ’s full permission to post this, he even helped me correct my apparently inconceivable out of touch mom mistakes.